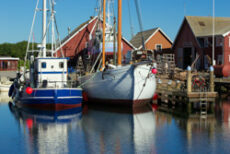 Skagen is one of the sunniest places in Denmark, part artistic bohemia, part fishing industry and part natural beauty. The beaches are beautiful with white sand and the sea water is clear and inviting. Danish and international artists have lived and worked here since the 19th century, largely drawn here by the fascinating and constantly changing light and the varied landscapes. Skagen is also a haven for seafood enthusiasts, and the picturesque settings offer plenty of opportunity for relaxation and recreation. Visit the inspiring museums and dwell at the world famous paintings by artists such as Michael and Anna Ancher and P.S. Krøyer.